If there’s anything you’ll come to learn about me, it’s that I am super lazy. I LOVE playing around with body butters and collecting moisturisers, but I can never seem to stick to an actual regimen. However, the spray moisturiser is so ridiculously easy that it’s hard not to stick to a routine. I tend to use this when I get out of the shower, just after drying off. It’s a very light moisturiser, and absorbs in about thirty seconds. Just long enough for me not to turn into an ice cube, standing around without a towel after a shower. I opted for the Cocoa Radiant, because I am a sucker for cocoa scented products. 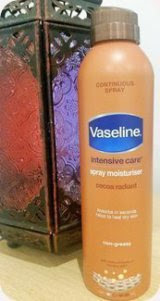 Vaseline has two other variants: Essential Moisture and Aloe Fresh. I’ll definitely be picking up the Essential Moisture one next. I love the idea of an oat scent since my all-time fave moisturiser is Soap and Glory’s Smoothie Star (which is to die for!). The other two would probably have scents better suited for summer than the cocoa radiant. The moisturiser only gives a light coverage, so I probably wouldn’t recommend it to anyone with very dry skin. It’s light enough to offer moisture, but not enough to be as "intensive" as it claims. Another thing I found was that it’s easy to lose control of the spray itself. I’m pretty heavy handed, and I find it very easy to accidentally spray too much in one area, which does leave me feeling oily and gross. With a bit of practice, and learning the hard way, it’s easy enough to keep an even spray, but watch out for that. Also, definitely make sure you’re stood on a carpet of sorts, and not a tiled floor or anything you can easily slip on. With the wide spray, and if you hold it too far from your body, you’ll cover the floor in the spray and it gets super slippery. So stay safe and make sure you’re stood on a bathmat! All in all, I’d definitely recommend for day to day use. It’s easy to travel with and is good for a quick top up when you need it. What do you guys think? Have you tried any of the others?